Report: “Several soldiers killed after requested to take photos faking capture of Lebanese town"
Israeli reports revealed that after the army failed to capture Bint Jbeil town, in southern Lebanon, army leaders requested several soldiers to take pictures showing the Israeli flag on top of a house in the town; several soldiers were killed by Hezbollah fighters while attempting to carry out the order. An Israeli officer testified in front of the Knesset Committee of Security and Foreign Affairs and said that several soldiers who fought in Lebanon were killed while attempting to take pictures showing the army’s victory. “Early August, one week before ceasefire, paratroopers were sent to Bint Jbeil town, in southern Lebanon to film Israeli soldiers occupying a rooftop and raising the Israeli flag”. “The aim was to provide proofs that we occupied the town after sever battles with Hezbollah fighters. While taking pictures we were attacked by fighters and three soldiers were killed, later on armored vehicles were sent to the area to evacuate us, they were also attacked and several soldiers were killed”. After the offices, Knesset member Ran Cohen, from Meretz party, said described the incident as “atrocity”, and added that this proves that the army was not sent to defend the country and its citizens, but was “sent to show off”". Instead of conducting an investigation as to why the Israeli Airforce deliberately targetted a clearly labelled Press vehicle with a missile on August 27th, the Israeli Government Press Office has chosen instead to focus on the fact that Palestinian journalists were in the vehicle -- leading them to conclude that 'terrorists' could be using press vehicles. The Israeli Government Press Office, an agency within the Prime Minister's office that acts as a mouthpiece for the Israeli government, and controls all domestic and international press, is apparently basing their conclusion on the idea that if a person is Palestinian, they are a terrorist, for there is absolutely no evidence that any press vehicle has ever been used in any act of violence. The Government Press Office is the only avenue by which foreign press can gain access to Israeli government officials, press conferences, and entry into the Gaza Strip and parts of the West Bank, has a long standing policy of harassing and intimidating news agencies who broadcast or print stories that the Office considers critical of Israel. In 2002, the Director of the Government Press Office, Danny Seaman, revoked the press cards of all Palestinian reporters "for security reasons". He also revoked the licenses of foreign reporters who he thought were reporting items that were critical of Israel, including Suzanne Goldenberg of The Guardian (UK), Lee Hockstader of the Washington Post, Sandro Contenta of the Montreal Star, and Gillian Findlay of ABC News. Instead of challenging Seaman's actions, which were clearly meant to intimidate and censor the foreign press, the news agencies of all four reporters decided to reassign them rather than risk their news agency being 'blacklisted' altogether by Israel. Rula Amin, an employee with CNN, was reassigned to Baghdad after the Israeli Government Press Office threatened CNN, and demanding that she be fired for perceived anti-Israel bias in her reporting of the daily violence of the Israeli occupation in the Palestinian territories. Since the Israeli 'Operation Summer Rains' began on June 27th, at least seven incidents of direct targetting of journalists have been reported. The Israeli Government Press Office justified the attack on the armored Reuters vehicle on August 27th by saying that the vehicle had not been licensed to be in Gaza. Reporters who wish to cover the conflict from inside the Gaza Strip are apparently expected to do so without armored vehicles or protection, as the Israeli government licenses for press vehicles allow them to be operated only within Israel, and its illegal settlements on Palestinian land. Apparently reporters are expected to report on the conflict taking place within the Palestinian Occupied Territories without ever entering the territories at all. Said Government Press Office Director Danny Seaman, "To the best of our knowledge, all of the vehicles' owners have been violating the conditions for a long time now, despite our requests. This is not the first time we are warning that these vehicles will be used by hostile agents to carry out a terror attack against Israel. The recent incident in Gaza only illustrates the danger." No investigation has been carried out as to why the press vehicle was targetted, and with the Government Press Office justifying the attack on the journalists, it appears unlikely that there will be any investigation into the attack. The Israeli missile strike on the Reuters vehicle has deterred reporters from entering the Gaza Strip to cover the conflict, which many reporters who have reported from Gaza say will give the world a one-sided view of the conflict by not showing the Palestinian side. Some have even gone so far as to say that is Israel's objective in its ongoing attacks on journalists. 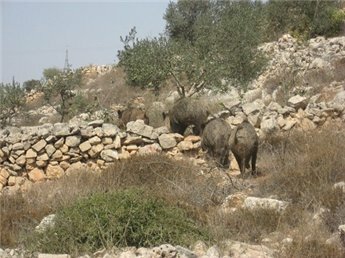 The Israeli army released wild pigs and poisonous snakes onto farm land belonging to Jama'en village near the West Bank city of Salfit, Wednesday. Eyewitnesses said that they saw an army truck emptying plastic containers of snakes in the area and then releasing scores of wild pigs. The Israeli authorities said was this action was taken to mantain the natural balance of the area. Several pigs attacked Abdullah Awwad, 50, from the village injuring him while he was walking home, local sources reported. A young Palestinian girl, Hiba Allah Mohammad Ishaq Yaghmour, from Hebron City in the southern West Bank is in Israeli prison. Monday, 17 April, marks the annual “Day of the Palestinian Prisoner.” More than 9,400 Palestinian political prisoners join Yaghmour in the 30-some odd Israeli prison system. Throughout the West Bank and Gaza Strip, prisoner support societies are hosting marches, demonstrations and sit-ins to protest the continued illegal detention of Palestinian political prisoners. The issue of the Israelis holding Palestinian political prisoners has become extremely sensitive as the numbers grow and securing their release continues to top the list of societal and governmental priorities. Israel is known, not only through personal accounts, but by internationally acclaimed human rights organizations as well, for violating the simplest human rights of Palestinians in its prison system, from taking them out of the occupied areas and into its own, to disallowing proper medical care, to extended sentences without charge or trial. Cases of physical and psychological torture are also well-documented and family visits are routinely denied. The life of a Palestinian inside an Israeli prison is, according to prisoners and their support societies alike, to be one of the ugliest aspects of Israeli occupation. Women are subject to gender-based abuse, from strip searches to beatings and torture. They are also often denied access to visits with their children, as are male prisoners. However some children born in Israeli prisons are allowed to stay with their mothers, which often is the best option the newborn has. The issue of prisoners is one of hundreds of egregious acts, including choking the West Bank with settlements and checkpoints, invasions, killing, more arrests, land confiscation, Wall construction and Judaizing Jerusalem and Hebron. The southern West Bank Hebron District proportionally bears much of the brunt, with 1,900 Palestinians in Israeli prisons, including 26 children. The girl, Hiba Allah Mohammad Ishaq Yaghmour, from Hebron, is just 15 years old. Her family begs the question whether there is any law whatsoever. She has been imprisoned for more than a year. She was born into a small and poor Hebron family on 23 September 1990. She has three brothers and was a student. Her family spoke via telephone Monday. PNN later came to realize that this was easier on the mother, as she holds her daughters notebooks, photos, and cries amongst her things. Her mother told PNN that on Saturday 26 February 2005 her ninth grade daughter headed to school when Israeli soldiers occupying the area incurred quickly into the center of the town. Israeli forces opened fire on the area of the Ibrahimi Mosque, leaving five bullet holes. They also hit the child in the stomach with an explosive bullet, those that come apart inside the body doing maximum damage. They are illegal under international law. The Israeli authorities put the girl in Hasharon Prison after a month in West Jerusalem’s Hadassah Hospital before she recovered from her injuries. And despite being promised proper medical care from inside the prison, the girl has received none. The Israeli prison doctor now insists she needs none. Both local and international human rights groups have had no luck in trying to intervene. On Thursday morning, two children from the West Bank city of Tubas were released after serving one year in Israeli prisons. Homam Daraghmah and Mohamed Daraghmah, both 15 years old, were arrested one year ago after the soldiers claimed that they carried home-made bomb near a military checkpoint north of the West Bank city of Jenin, local sources reported. Justice Rahel Barkai of the Israeli Be'er Shiva District Court sentenced a rejected an appeal by the Israeli prosecution to sentence a settler to seven years for shooting a Palestinian resident and decided to sentence him only to two consecutive years and one year on parole. The settler Daniel Finner, 39, a resident of the West Bank settlement of Tapuah, shot and wounded a Palestinian resident of Al Mawassi area in the Gaza Strip, in June 2005. According to the charges, Finner burst onto the scene with a loaded Uzi submachine gun and began firing in the air and directly at the Palestinians. One Palestinian man was severely wounded by the gunfire and was rushed to a hospital to be operated upon. The attack was carried out three months before Israel implemented the Disengagement Plan. 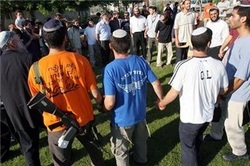 The settler was among an extremist settlers group that attacked Palestinian families staying near the Gaza Beach. Israeli online daily Haaretz reported that Finner was at a hotel occupied by the settlers at the Gaza beach. He was carrying out maintenance work on the hotel's electricity system. The assailant told the court that he cannot understand why is the court making a “big deal out of shooting a Palestinian resident”. The Israeli prosecution demanded the court to sentence the resident to seven years imprisonment and to compensate the injured resident, but the court rejected the appeal. Justice Barkai did not rule that Finner should be disarmed but decided to bar him from carrying his gun outside the borders of his settlement, Tapuah. She also said in her ruling that the assailant “did not think that wounding a Palestinian was of any importance, and returned calmly to the hotel after the event. Later, he returned to his home in Tapuah, completely confident that he would not be punished for his actions", yet he received a mild sentence. The Israeli Information Center for Human Rights in the Occupied Territories, B'Tselem, and Physicians for Human Rights, in Israel (PHR), wrote on Thursday to the Israeli army Judge Advocate General, and demanded the Police to investigate the violation of the dignity of the detainees in the Israeli military operation in Jericho. In the course of the operation, Israeli soldiers forced the detainees to undress and led them out clad only in their underwear. Images of the naked detainees were broadcast in the electronic media, and published widely in the press in Israel and throughout the world. In testimonies given to B'Tselem, detainees stressed the humiliation they felt as a result of their naked images appearing in the media. In their letter to the JAG, Brigadier General Avihai Mandelblit, the organizations stated that article 27 of the 4th Geneva Convention entitles detainees to respectful treatment, and that the forces holding them were obligated to protect them from, among other things, "public curiosity". Even if the security considerations behind the decision to strip the detainees were legitimate, these considerations do not justify parading the detainees in front of the media. It was the duty of the army to take proactive steps to conceal the detainees from the cameras. Since no action of this kind was taken – without any security justification and despite the fact that such action was possible – Israel has violated its obligation under Article 27 of the 4th Geneva Convention. Israeli soldiers shot a Palestinian medic during an invasion to Balata refugee camp, in the West Bank city of Nablus two days ago; the medic is currently hospitalized at an Israeli hospital with handcuffs tightened, and his two feet bound to his “recovery” bed. The medic was identified as Ihab Hashim Mansour. Mansour is one among dozens of residents who were injured during a major invasion carried out by the Israeli army in Balata refugee camp, east of Nablus, last week. Mansour was shot in his head, on February 28 as he, and other medics and medical teams, were attempting to aid the injured residents and transfer the dead bodies to hospital. Lawyer Yassin, of the Prisoners Supporters Society (PSS), managed to visit Mansour and demanded the Israeli hospital to untie him; soldiers “guarding” the injured medic said that they have higher orders to keep him tied. Mansour was working a a volunteer medic during the invasion. The Society strongly condemned the inhuman treatment practiced against Mansour. Yassin added that the PSS contacted the International Red Cross, Doctors Without Borders, and the Israeli High Court of Justice.